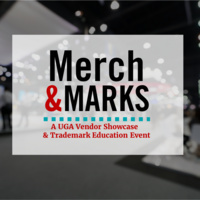 The Division of Marketing and Communications is hosting a drop-in vendor showcase to connect UGA merchandise and apparel decision-makers with approved licensees. The goals are to facilitate vendor-campus personnel introductions, encourage event networking and provide a better understanding of vendor products and services. 10-minute info-sessions with follow-up Q&A opportunities will run every half-hour on the university Visual Identity System, the Trademarks Compliance Review and Approval Process and athletic marks and usage. Guests can drop in to meet vendors face-to-face, attend quick info sessions, and get up to speed on the latest products, services, processes and visual identity system updates. All UGA non-retail licensees providing logo-ed apparel and merchandise for on-campus promotional use are invited to participate. Please click here to register to exhibit. Any on-campus personnel interested in learning more about using UGA trademarks to promote their programs, brand merchandise for give-away or better align their efforts with the UGA brand are invited. Please click here to register to attend.